LOS ANGELES -- Enter a parking ramp or lot in Los Angeles and there's a good chance you'll see "Compact Only" parking stalls. There's also a good chance you'll see people twisting and squirming in an effort to exit their vehicles without bashing their car doors into the adjacent vehicle. It's nothing new. In a Nov. 17, 1997 Los Angeles Times article, Eric Slater gives his take on a parking lot in Woodland Hills. "The absurdist bit of urban theater plays itself out most every day at the Warner Plaza-Gateway Plaza shopping center in Woodland Hills, as drivers circle endlessly in their exasperating quest for a parking space. "They are thrilled to find a spot near the Vons even if they shop at the Ralphs, happy to settle for Starbucks though they really wanted Jamba Juice. "Any port in a parking storm. "What is it about this lot–and hundreds of others across Los Angeles–that makes it so difficult to negotiate? Overdevelopment? Awkward design? "As much as anything, perhaps, it is the popularity of big cars on the heels of an era that promoted the “compact only” parking space." More than a decade later, the Geneva Auto Show offers five cars fit for small spaces. 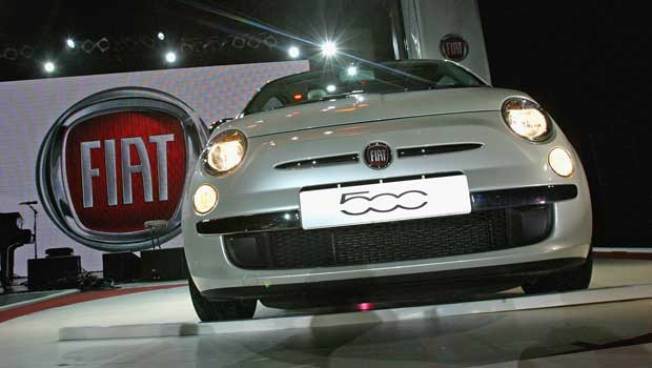 The Chevrolet Spark, Fiat 500 C, Alfa Romeo MiTo GTA, Volkswagen Polo and Mazdaspeed3 -- all 2010 models -- are some of the smallest, and sprightliest, cars at this year's show. Click here to read Road and Track's article about the mighty mites.